Chateau Kamiya Pilsner is a German style pilsner from Ushiku Brewery. According to the Ushiki Brewery homepage, it’s an all-malt beer but also contains an abundance of German hops. 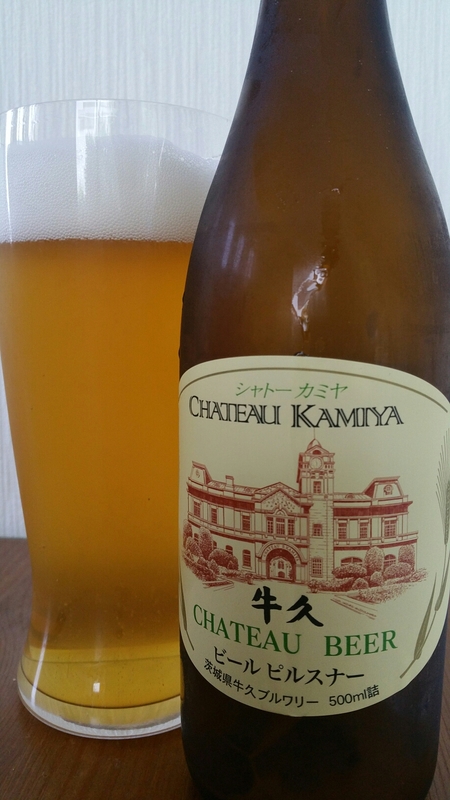 Chateau Kamiya Pilsner has an abv of 5.5% and only has a shelf-life of about three months so it’s best drunk fresh either at the brewery or on the train home from the brewery. Crisper than a big bag of crispy crisp things. Chateau Kamiya Pilsner poured out a clear golden colour with a fair amount of crystal clear white head on top that lingered throughout the beer if not on top but around the rim of the beer and glass. Thee aroma was a lacklustre of snap of floral notes and a miniscule amount citrusy lemon twang but not much else was there. Hops aren’t the cheapest of commodities on the market but I expected some hops in here even if to produce a crisp nose. The body was crisper than the nose and the hops clearly had worked their magic but it was strange that they weren’t noticeable in the aroma. I’m always amazed how a beer can be so lacking in the aroma department yet pull you in with the body which Chateau Kamiya Pilsner does. The malts were clean and non-fussy and brought a little bit of sweetness to the beer; however, it all ends up a bit of a mess as the flavours just merge into something indistinguishable. Chateau Kamiya Pilsner started off bland but ended up in a mish-mash of flavours. It’s alright if you are at Ushiki Brewery and having a beer but it isn’t much better than the standard pilsners on the market.